Apex Planning Consultants is delighted to have recently secured planning and listed building consent for a client in Weston Underwood (Milton Keynes). 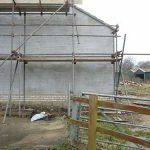 A previous application for the demolition of a curtilage listed building and its replacement with a new build garage, and also the partial demolition of a stone boundary wall was refused and Apex Planning Consultants was called in to consider the merits of an appeal. Following an assessment of the proposal and the reasons for refusal, the client was advised that subject to some additional justification and amendment to the scheme there would be a good chance of planning & listed building consent being granted via a new application and this should be both cost effective and quicker, compared to the appeal process. Accordingly, the client instructed Apex Planning Consultants to coordinate the existing team of consultants so they could amend their plans / reports appropriately, and to engage the services of a heritage consultant, too. In due course a revised application was submitted and various additional concerns were overcome through on-going negotiation between the planning and highway officers at the Council and Apex Planning Consultants. The application was subsequently reported to the Planning Committee and, despite continued objection from the Council’s conservation officer, Apex Planning Consultants presented to the Planning Committee and provided convincing reasons why the objection should be disregarded and planning and listed building consent should be granted. The presentation was ably assisted by a further one from the Ward councillor, whose assistance was sought by the client on advice from Apex Planning Consultants. We are very pleased to announce that on a vote to decide whether the application should be approved, the Committee voted unanimously in favour! If you would like to discuss a planning, listed building and or conservation area development issue, pleased do not hesitate to contact Paul Smith at Apex Planning Consultants.